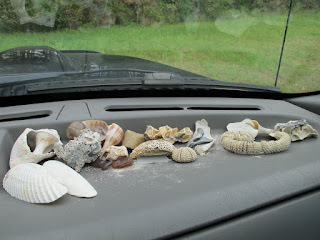 TheWanderer: Catching up on Our Annual Full Time RV Migration North..We Have Arrived and Been Busy! 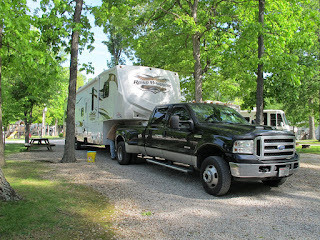 Catching up on Our Annual Full Time RV Migration North..We Have Arrived and Been Busy! Our trip home was uneventful yet very enjoyable, other than Illinois and Indiana Interstates, which leave something to be desired as far a a smooth ride...nothing against either state, we have been to many lovely areas in both, but the Interstates are just plain rough and buckled, we even resorted to adding a couple days to journey by taking the back roads and enjoying ourselves a bit. 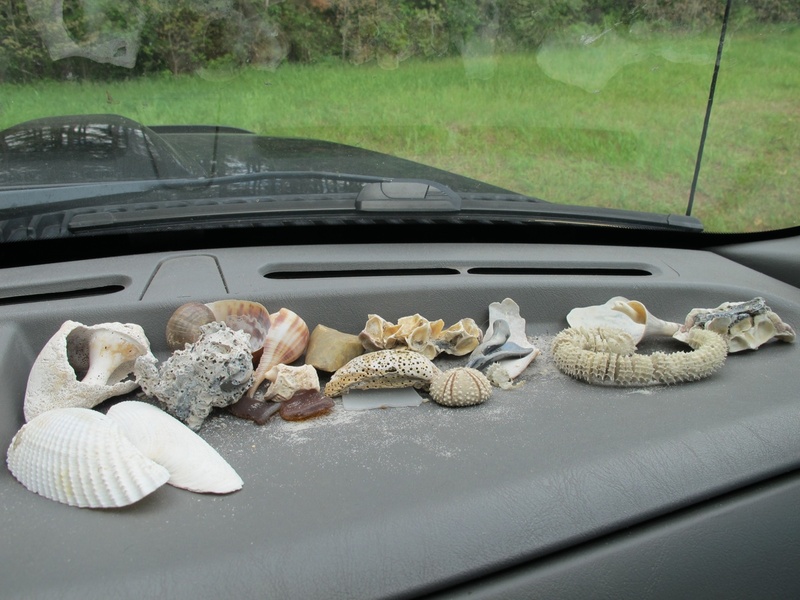 I, of course have an ever changing palate of Sea Shells in the South and Pine Cones in the North...so predictable! 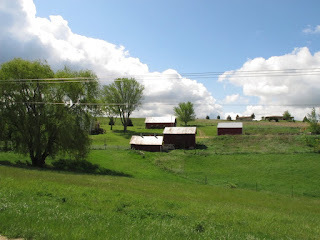 Another Farm, What a Surprise! Had a great time trying out the new camera, shot these pics out the window in 800 speed shutter time, it really did a good job of freezing the action! 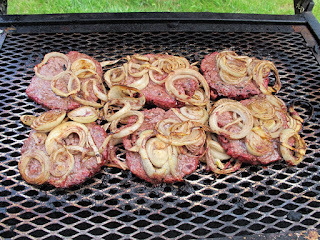 Below is our usual barbeque fare cooked on our Holland Gas Grill, I've found a new way to cook burgers, I just throw a couple of large onions sliced up on the grill and throw the raw burgers on top, then when I flip over the burgers I flip the onions at the same time. 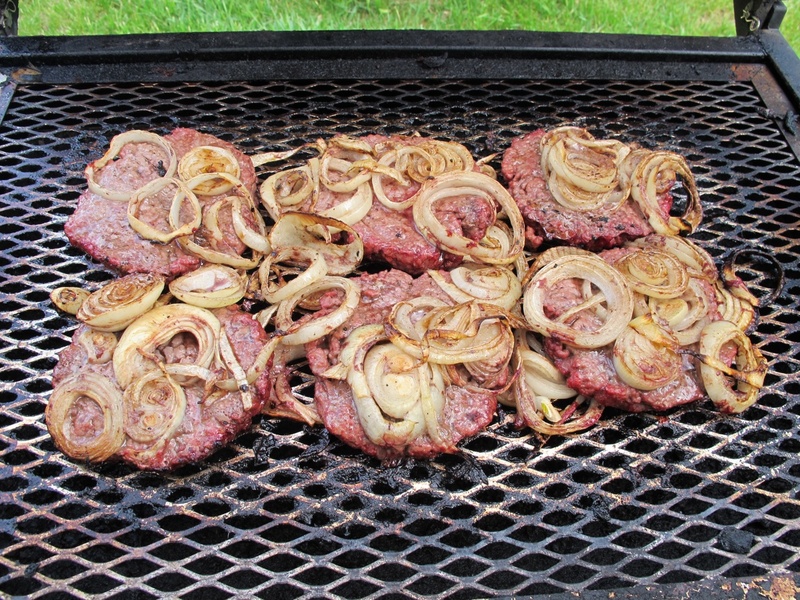 It really flavors the burgers and keeps them juicy while making the onions perfect for eating! Next I plan throwing a few onions and green peppers in too for good measure. Hope you Spring is and wonderful and a Big Shout Out to Jill and Frank, who have just joined us Full Timers on the road in a new Motor coach, (well at least it's new to them, I hear it's pristine!) Hope every mile is a safe and Blessed one for them, always good to share the enthusiasm of new converts! As for us, we are still very happy with our lifestyle, we even gave up our seasonal Campsite on the Mississippi and are just being Gypsies this year, we always get a really reasonable rate when Campground Owners find out we are Full Timers and Doyle always chips in with chores around the Campground anyway...so it always works out good for us! 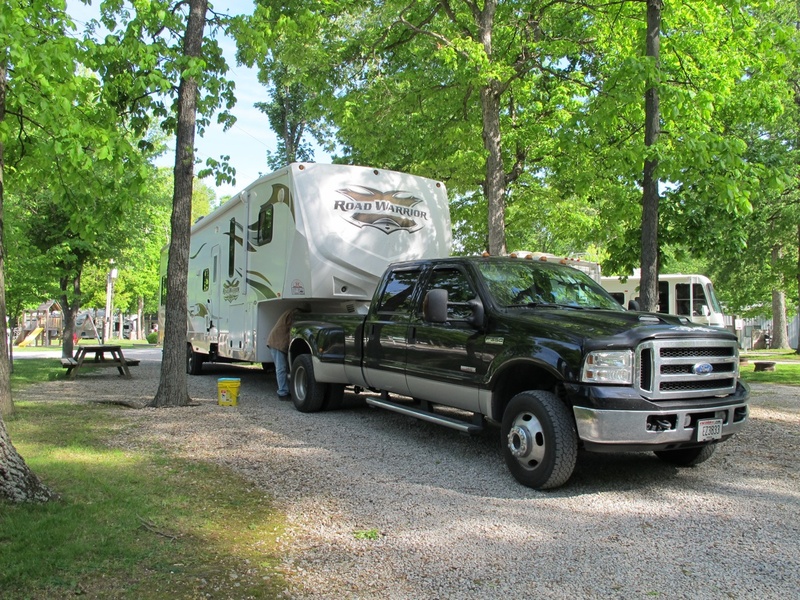 I wanted to mention we are at Lost Falls Campground near Black river Falls Wisconsin. 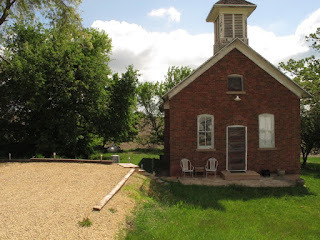 If we do decide to get a permanent lot, it will probably be here, the owners run a tight ship and it's so very quiet here you can't help but fall in love with it's tranquil setting with local shopping within 10 miles! oooooooooooo! It was so fun to read your post today and see our names. Makes me feel like a real full-timer! I do so enjoy your writing style. Hope we wind up at the same place at the same time sometime. It is good to hear about your journeys. it was very delightful journey for you and also, you had great fun at the time of journey. Thanks for sharing such a moment you had during the time of journey.